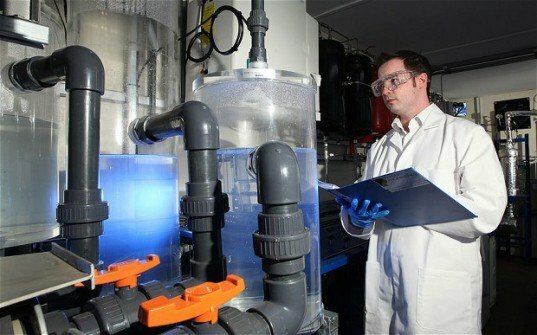 Air Fuel Synthesis (AFS), a small firm in Stockton-on-Tees, UK, has succeedin in synthesizing gasoline from water and carbon dioxide (CO2) extracted from air. The Independent reported on Friday that the company has manufactured five liters of gas since August using a small refinery at its demonstrator plant. While that is a small volume to start with, AFS plans larger demonstrations and commercial-scale production. Essentially, the process will allow renewable energy to be converted into usable fuel in a sustainable carbon-neutral process. AFS company materials say that its process “captures carbon dioxide and water from the air, electrolyzes the water to make hydrogen, and reacts the carbon dioxide and hydrogen together to make hydrocarbon fuels.” All components of the system are available now as either off-the-shelf components or demonstrations. Paul Marks, writing for New Scientist, cautions that, in spite of the promise of the new technology, its energy efficiency has yet to be proven. Douglas Stephan, a chemist in Canada who is researching the production of fuel from CO2, tells Marks, “Until a detailed assessment of the energy efficiency is enunciated, I would remain skeptical about this technology.” That apparently isn’t going to be done until AFS has had a chance to build a larger demonstration plant allowing for evaluation of this key question. Petrol from Air and Water? 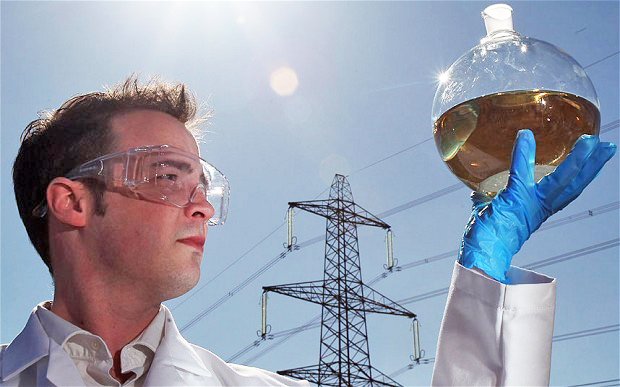 A new method to produce petrol for more information http://www.trendsfair.com/petrol-can-be-made-from-air-and-water/ The news that burst on Friday said that petrol can be made from air and water. At present, the petrol is being extracted from ores and then pumped in to vehicles in the petrol bunks on the roadsides. Well this is great as a source of fuel for current cars, but it's using hydrogen from water and CO2 that will get to the atmosphere again because of the combustion in the car. If you use hydrogen in the car, it's a more direct conversion and less energy is used. So how small of a footprint can this process be squeezed into? We already have residential garage-based solar/wind (free energy) powered systems that split water into hydrogen 24x7 and compress it into a tank for later use home fueling our autos retrofitted for dual fuel. One drawback of compressed gas fuel is that its energy density cannot match liquid fuels - which the AFS technology seems to overcome. Well, don't get so excited about it. We all know that energy can't be produced without using energy. For solar electricity production, the ratio is ~1:6 and for wind, is ~1:20, which means, if the energy you spent to make solar modules is 1, then return is 6 times of the energy you put in for the life of solar modules and for wind it' around 20 times. So how much energy it will cost to produce the liquid fuel?, because CO2 and H2O are very stable molecules and to break them up it will take lots of energy! awesome cus we need water to be 5 bucks a gallon.. i never drank that stuff anyways..
Its a revolutionary technology.We have to work out for mass production of the fuel.The company can set up plants in India where there is huge tracks of land and other required resources available and the climate is also temperate. This sounds great. A real boost to the environment and economies. If it works I just hope coal and oil barons don't buy it out and bury it. I'm not a scientist or engineer but it their is anything I can do let me know.